You have come to my Collections page. I have gathered a large number of items related to the history of Rutgers University and the City of New Brunswick. On this page you will find my experiments at displaying some of that collection. Handbooks, guides, catalogues and directories to Rutgers from the 19th and 20th centuries. The Class of 1862 - These are images from an 1862 "yearbook" that was compiled for the class. It has the signatures of each student as well as some extra info like their town of residence or fraternity affiliation. The pictures seen here are on the blurry side because they were taken with a digital camera. The pages could not be scanned properly because the book is too large and fragile to put on the scanner bed. The Class of 1923 - A collection of original snapshots used to produce the 1923 Scarlet Letter. In this era, the junior class produced the yearbook, so the photos probably date from 1922. 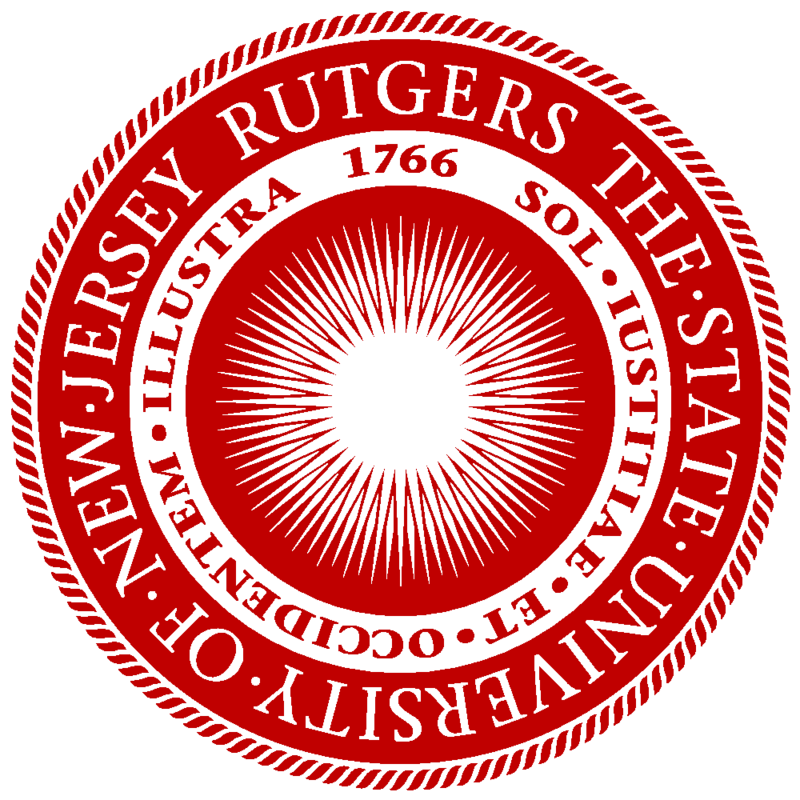 Rutgers alumni publications including magazines, class updates, and mailings. Rutgers student publications including The Targum, Chanticleer, The Rutgers Anthologist and more. Programs and various items from Rutgers University events. Addresses at the Inauguration of Merrill Edwards Gates as President of Rutgers College. 1882. Songs of Rutgers - a collection of songs in use by the Glee Club and students of Rutgers College. Compiled and edited by Frank S. Scudder. 1885. A Message to Rutgers Men from Lansing P. Shield. Christmas Music - An Album of Traditional Carols sung by the Rutgers University Glee Club. 1950. Journal of the Rutgers University Library - Vol.1, No.1. December 1937. 1912 Rutgers Calendar showing college life from one hundred years ago. The cover of this calendar is a sheet of embossed leather. The Scarlet Letter - 1890. Volume XIX of the Rutgers College Yearbook. Produced by the class of 1890 in June of 1889. The Red and the Black, 1969. Volume 1, Number 1 of a Vietnam era alternative/protest newspaper published by Rutgers Students. Was there an issue 2? I’d love to know. Does it Pay? - Baccalaureate Sermon Preached June 17, 1906 to the Graduating Class of Rutgers College. Research in Panama for Rutgers University. September – December, 1944. The research concerned the transmission and reception of sound in jungle environments. A paper written by Carl F. Eyring, published in the October 1946 edition of The Journal of the Acoustical Society of America, can be found here. Interscholastic Track and Field Meet under the Auspices of Rutgers College A.A. May 19, 1906. Report from Rutgers - A Brief Report from Rutgers, the State University of New Jersey. Rutgers Rah! Published by the Department of Alumni Relations in cooperation with the Department of Public Relations. Rutgers Athletic News - Published by the Departments of Public Relations and Athletics. Proposal for the location of the National Football Shrine and Hall of Fame to be located in New Brunswick, NJ. 1949. The Leland E. Holbrook Collection - Getting started at the University in 1962. Albert Stanburrough Cook - A Tribute by Charles W. Whitman. Reprinted from the Rutgers Alumni Monthly Vol.VII, No.2. November, 1927. Rutgers Atlantic 10 Tournament Info Booklet. 1990. Rutgers and New Brunswick First day postal covers (and a few other postal things) - A First Day Cover (FDC) is an envelope or card bearing a stamp which is cancelled on the day the stamp is initially placed on sale by the postal authorities. Along with the stamp and postal cancel, covers often include a cachet (pronounced ka-shay), which compliments or tells something about the stamp. 1957-1958 WRSU Rutgers and Douglass Social and Academic Calendar. WRSU Fall 2000 Program Guide. Petition to the Alpha Kappa Pi Fraternity from Phi Lambda Sigma Fraternity of Rutgers University. Issued by the Fraternity February 1, 1931. Rutgers and the American Way of Life by Philip Van Doren Stern. 1941. Reconstruction of an American College. Some Proposals for Rutgers College by Warren I. Susman. October, 1968. An unknown Latin document. Can you read it? Let me know! The Letters of Elihu Doty - Elihu Doty (20 September 1809 – 30 November 1864) was an American missionary to China. He was responsible for the first textbook of Southern Min in English. Along with John Van Nest Talmage he is credited with the invention of Peh-oe-ji, the most common orthography used to write Southern Min.He studied first at Rutgers College and later at the New Brunswick Theological Seminary. Newark Sunday News Magazine Section V, December 11, 1955 (Reprinted by the Sunday News). Part of the “Colleges of New Jersey” Series. Duties of Leaders and Privates in A Fire Action. Rugers College Cadet Corps. March 20, 1918. Dedicated to serving the needs of adult, nontraditional students at Rutgers. Untitled - The Magazine of Rutgers University College. Bulletin of Rutgers University, Series 26, No.28. June 5, 1950. University College Evening Sessions Issue. Patterson Division. The Lamplighter - Rutgers University, University College, Patterson Division. Vol.2, 1953. University College Student Handbook. Published by the Office of the Dean of Students for University College Students in Camden, Newark, New Brunswick, Patterson and Jersey City. 1957-1958. Parking and Traffic Regulations for University College, University Extension, and Part Time Graduate Students. 1967. Viewbook - Rutgers Preparatory School. 1920. Dance Card - Rutgers Preparatory School Football Dance. December 5, 1924. Dance Card - Rutgers Preparatory School Senior Dance, Class of 1925. June 17, 1925. Tom Brown at Rutgers - Life at Rutgers Prep in the 1930s. Argo. Monthly Publication of the Rutgers Prep School. Rutgers Preparatory School 167th Commencement. June 15, 1933. Rutgers Preparatory School - Annual Catalog. 1940. 1922 Quair - This is the very first issue of the NJC / Douglass Yearbook. NJC / Douglass Handbooks - Your guide to everything NJC and Douglass. NJC / Douglass Alumnae Publications - Read some (very) old back issues of Alumnae publications. NJC / Douglass Student Publications including The Campus News, The Horn Book, and more. Katherine Ewald NJC Snapshot Album - Views of the NJC Campus and campus life from 1925 to 1930. Ann Zid NJC Snapshot Album - Views of the NJC Campus and campus life in the late 1930s. Note: The missing photo on the 7th page labeled “Dean Corwin’s Residence” is probably this building (Follow link and click “Search Maps”), now the Douglass/Cook writing center. Cook Book of the Ex-Presidents Club of the Third District N.J.S.F.W.C. - 1925 - Compiled from recipes contributed by members of Clubs of the Third District, and to be sold for the benefit of the Fund for the Music Studio at the New Jersey College for Women at New Brunswick New Jersey. Songs of N.J.C. 2nd Edition, 1924. Compiled by the Song Book Committee; class of 1925; edited by Howard D. Mckinney. Reflections from the Looking Glass, 1956 - The 1946 Quair was subtitled “Through The Looking Glass” which reflected its Alice in Wonderland theme. For their 10th reunion, the class of 1946 put together this update to show what they had done since graduation. Report of the Commission on Ethnic and Race Relations of Douglass College. January, 1972. Viewbook - New Jersey College for Women. 1921. Viewbook - Bulletin of New Jersey College for Women, Rutgers University. No.26, June, 1935. Viewbook - New Jersey College for Women. 1943. Viewbook - Douglass College. Circa 1955. Twenty-Five Years Later. Two Anniversary Sketches of The New Jersey College for Women by Rosamond Sawyer Moxon and Mabel Clarke Peabody. 1943. "From Pen to Coop" - Sheet music from the show produced by the New Jersey College for Women Class of 1939. Report of the Commission on Douglass as a Resident College. September, 1969. A Greeting to New Members of Phi Beta Kappa. 1928. (Gladys M. Francis, NJC class of 1929). Constitution and By-Laws. Co-operative Association of the New Jersey College for Women. 1924. Toastmaster notes by Gladys Francis for the proceedings of the 9th reunion of the class of 1929, 1974 (45 years since graduation). Rutgers University Graduate Students Registration and Record Book. Gladys May Francis, NJC Class of 1929. We are changing our name. Douglass College April, 1955. Three letters from George H. Cook to William S. Stryker. Mr. Stryker was a noted 19th century military historian. The works mentioned by Professor Cook in these letters can be found at the Internet Archive (https://tinyurl.com/yabqt6ho). Agreement between the Trustees of Rutgers College in New Jersey and Benjamin Sears. 1888. Four Leaf Clover - Yearbook of the Short Courses in Agriculture of the New Jersey State College at New Brunswick – Vol.1, 1913. Four Leaf Clover - Yearbook of the Short Courses in Agriculture of the New Jersey State College at New Brunswick – Vol.2, 1914. Four Leaf Clover - Yearbook of the Short Courses in Agriculture of the New Jersey State College at New Brunswick – 1921. Fifty Years of Service to Agriculture. Being a brief history of the New Jersey State Agricultural Experiment Station. 1930. Initiate’s Handbook. Cook Chapter of The Fraternity of Alpha Zeta. Circa 1946. New Jersey Agriculture. Vol. 48, No.3. May-June, 1966. Published Bi-Monthly by the College of Agriculture and Environmental Science, Rutgers University New Brunswick. The ‘Cook’ Book - Cook College Parents Association, 1983. Rutgers Cooperative Extension Service Insect-Disease-Weed Newsletter - Some issues from 1993-1994 in .pdf format . Livingston College - Admission to the University in New Brunswick New Jersey. 1971. Dear Freshman. May 12, 1979. Scarlet Ray – Published by the Senior Class, Rutgers College of Pharmacy. Newark New Jersey, 1950. City of New Brunswick, New Jersey. Souvenir of New Brunswick, N.J. - Miniature Post Cards in Colors. These mini post cards are replicas of the larger versions. They measure about 2 x 3 inches. Souvenir Song: New Brunswick You’re Our Pride - Written for the 200th Anniversary of the City of New Brunswick in 1930. Views of New Brunswick New Jersey - Published by L.H. Nelson Co. of Portland Maine, 1905. Annual Reports of the Free Public and Free Circulating Libraries Of New Brunswick from the late 19th and early 20th centuries. Our Public Schools - Section 2 of the Annual Report of the BOE, New Brunswick, NJ - 1938. Directory of the City of New Brunswick New Jersey, 1855-1856. New Brunswick in the World War by John P. Wall. 1921. New Brunswick Almanack for the Year of Our Lord 1828. Prelude to Revolution - Prelude to Revolution. The New Brunswick Meeting of July 21, 1774 by John A. Latschar. 1975. St. Peter’s Hospital – What Has Been Done, What is Still Left to be Done. 1930. Historic Map of New Brunswick N.J. Quartermillennial of the Settlement, Bicentennial of the Royal Charter. Anniversary Celebration, October 12-15, 1930. Notes by Charles Deshler. Architectural History of New Brunswick, New Jersey 1681-1900 by Barbara Cyviner Listokin. 1976. Prelude to a Revolution. A Commemorative Program at Kirkpatrick Chapel - Rutgers University New Brunswick, New Jersey. Sunday, July 21, 1974. 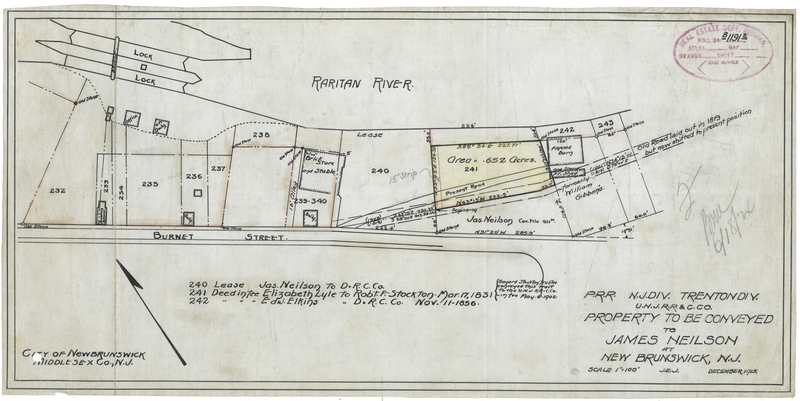 Surveyor's map on linen - Property to be conveyed to James Neilson at New Brunswick, NJ. December, 1915. Catalogue of the Officers, Alumni, and Students of the Theological Seminary of the Reformed Dutch Church, New Brunswick, N.J. 1843-44. Catalogue of the Officers and Students of the Theological Seminary of the Reformed Dutch Church, New Brunswick, N.J. 1857. New Brunswick Yesterday. A Pictorial Glimpse published by First Savings. 1977. Woodrow Wilson Hotel. Information booklet about New Brunswick’s distinctive hotel. 1929. Woodrow Wilson Hotel. Formal Opening and Banquet. April 17, 1929. The City of New Brunswick - Its History, Its Homes & Its Industries. Printed 1909, reprinted 1976. Record of Christ Church, New Brunswick by The Rev. Alfred Stubbs, S.T.D., Rector. 1865. Log Book. Girl Scouts, Third Division, New Brunswick NJ. 1932. The School of the Prophets. A Sermon Preached in the Reformed Dutch Church Before the Board of Superintendents of the Theological School of the Reformed Dutch Church July 11, 1839 by Rev. Benjamin C. Taylor. Also includes a Catalogue of Students of Theology, 1812-1839. Deed of sale from Albert Bollschweiler, sheriff of Middlesex County to Hyman M. Mann and Soloman Mann of Plainfield New Jersey for a property on Easton Ave, April 22, 1912. This appears to have been a sale brought on by a mortgage default and unpaid taxes. Unfortunately, without more research on property ownership in 1912, there is no way to know exactly where this property is. Program - Fortune and Men’s Eyes. George Street Playhouse. November, 1975. Studebaker Telephone Directory - New Brunswick Plant. July 7, 1952. On the highway. New Brunswick, 1680-1930. Supplement to the Sunday Times, New Brunswick, N.J., October 5, 1930. NeverSlip Manufacturing Co. Catalog. Circa 1900. Seventh Annual Performance of The Messiah Presented by the Oratorio Choir of the New Brunswick Council of Churches. December 9, 1951. My memorabilia display. See images of the display I put up at the Franklin Lakes Library in 2007. My 2013 memorabilia display. Also put up in the Franklin Lakes Library. June, 2013. Have something you’d like to sell or donate?